In 2009, a portion of the South Bronx in New York City was rezoned, with the goal of creating affordable housing, mixed-use development, and accessible community and pedestrian access. However, it wasn’t until 2015, when SCLE Architects broke ground on the 810 River Avenue Apartments, that the goal and vision of that rezoning began to be realized. With a focus on sustainability and livability, the project incorporated St. 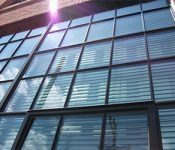 Cloud Window’s advanced line of acoustic windows in order to minimize noise from road and rail traffic. As in any housing development in a major city, noise was a primary concern throughout the development process. With an elevated train line running next to the building, as well as road and pedestrian traffic, and the nearby Yankee Stadium, acoustic windows and extensive insulation were a must. To achieve this, the architect enlisted the St. Cloud Window SCW900, SCW2500 and SCW3500 Series of acoustic windows. The windows have OITC, or Outdoor/Indoor Transmission Class, ratings of 35-37, which significantly mitigates that external noise. The 190,000 square-foot, 17-story tower contains 134 housing units, 61 garage spaces and 26,000 square feet of commercial and community facility space. One interesting component of the building is its ‘windowed’ stairwells, which were designed to encourage physical activity. In sum, the structure has 416 operable and 216 fixed windows. 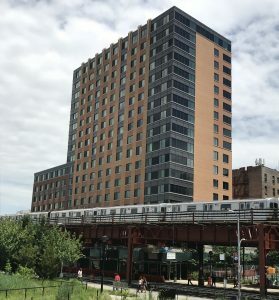 The 810 River Avenue Apartments are part of the ongoing revitalization efforts in the South Bronx, which involve not only new housing and mixed-use development, but also infrastructure improvements. One of the overarching goals of these efforts is to provide affordable housing access in an underserved part of New York City. As a green, mixed-use, mixed-income, transit-oriented building, the 810 River Avenue Apartments helps to achieve this goal. St. 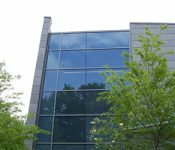 Cloud Window manufactures the custom-made aluminum window and door products for new building construction, commercial window replacement, historic window replacement and projects where high-performance acoustic attenuation sets the standard. To learn more, view our full product line or contact us to request a quote and get started.